As per the project announcement on the mailing list, the goal of this project is to create a robot capable of serving (some) cocktails. 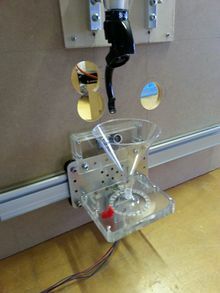 Some pictures of cocktail robots can be found in the presentation shown at open night on 2014-03-26. To have a functional booze-serving robot ready to take to EM Fields at the end of August 2014. To have some visibly moving part(s) - i.e. not the Bartendro approach where ingredients are pumped to a static glass via static tubes. See also: Makers page to see who's doing what. Meeting are at 19:30 on Thursdays at Nottinghack, change announcements will be via the Nottinghack mailing list. 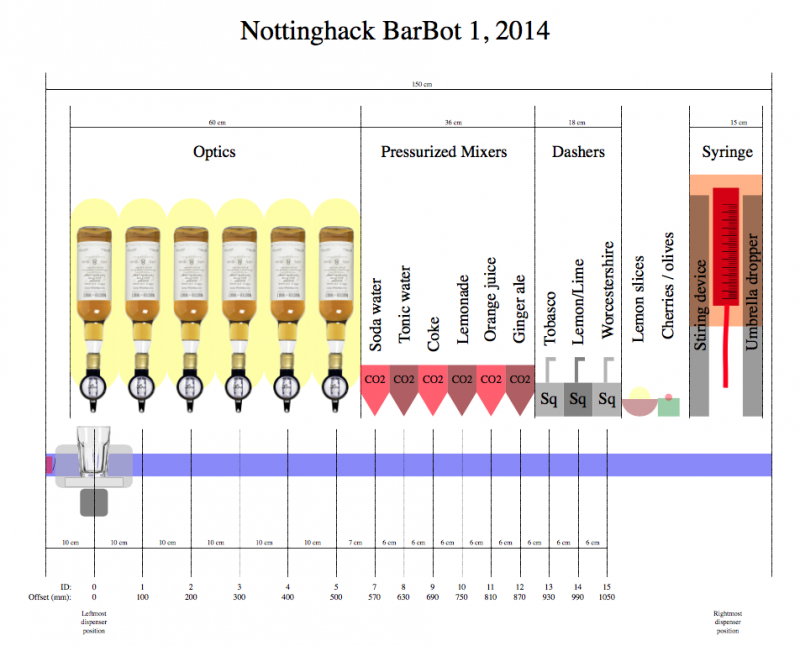 To communicate with the makers online, please join the barbot mailing list. The goal is to have a working robot to take to EM Fields which is at the end of August 2014. More details of sub-project deadlines / goals on the BarBot/Project timeline page. I'd like to keep track of how much is spent on what so I can look back at the end of the project and have a good idea of what it costs to do something like this. I'd also like to reimburse anyone who spends more than their fair share. Please track expenditure on the Purchases and expenditure page. Distance is from the far left. and to the centre of each station. For coding distance from end stop subtract 105 mm Actual drop position for the umbrella may be. About £60 for nice disposable glasses or about £20 for less nice ones. We can have a mixture of them. Basically, we're looking at a £200 bill for all this if we're going to get cheap booze... more money means better quality boozes. Building the whole thing is going to cost moneys. So far (as of June 11th 2014), people who are working on the project are buying components they need them, and (I hope) filling in the Purchases and expenditure page. However, costs are going to mount and I'd like to reimburse people for the money they've spent. We also need money for supplies, and to pay for a van to take everything to EMF camp. Solicit moneys from the space as part of the EMF camp efforts. This has already been provisionally agreed in the case of hiring a van, and in return I have offered to provide a service to the space by taking larger items of infra for the event, and perhaps tents and other large items for members who are attending. Poker nights at the space: £10 buy in, £5 goes to BarBot funds.